AT THIS TIME every summer I can feel my anticipation rising as I look forward to another film festival to be conducted at the Immaculate Conception in Douglaston. This fall will be the 56th festival. Over 300 films, all classics or near-classics, have been shown in the previous festivals. Screening the films has been a wonderful educational experience for me. I tend to think that each new festival is one of the best, but since I select the films to be shown, I am not an impartial critic. I am certain that anyone who has attended the festival with some regularity over the last 35 years has achieved the equivalent of an excellent course on film. What I have noticed as I looked over the list of films that have been shown is that they, in one way or another, dramatize the sin of prejudice. I am certain that I have done this because I believe that films have a special power to educate and to challenge peoples’ consciences. Reflecting on my own conscience, I have become aware that a conscience does not change easily. I think we tend to have the same views about morality for long periods of time. A powerful film seems to be an excellent way to challenge a conscience. Great films can work on both an intellectual and an emotional level. One of the films that will be screened is Frank Capra’s “American Madness.” I think Capra was one of the great American directors. In previous festivals we have shown many of his films: “It Happened One Night,” “Mr. Deeds Goes to Town,” “Mr. Smith Goes to Washington,” “Meet John Doe,” “It’s A Wonderful Life.” All of these are exceptionally good films. I only saw “American Madness” a few months ago, but as soon as I viewed it, I knew that I had to show it in a festival. The values in the film are typical of a Capra film. The depiction of virtue is beautiful. The film stars Walter Huston and Pat O’Brien. My guess is that no one who attends the screening of “American Madness” will have seen the film previously. There is a short scene between Huston and O’Brien in which Huston’s talent and skill startled me. He was excellent as the devil in “The Devil and Daniel Webster,” as James Cagney’s father in “Yankee Doodle Dandy” and in his Academy Award-winning performance in “The Treasure of the Sierra Madre,” but his acting in “American Madness” is special. For many years I have wanted to show Steven Spielberg’s “Schindler’s List,” but the length of the film, 190 minutes, seemed prohibitive. I hope starting the film half an hour earlier than the other films’ starting time will solve the problem. 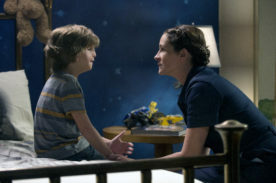 One of the films that I was determined to show is “Wonder,” which I think was the best film released last year even though it was not even nominated for an Academy Award. Based on a popular novel, the film dramatizes the experiences of a young boy whose face is seriously disfigured. After I saw the film, I called a counselor and asked how old a child should be in order to be able to watch this film. She replied, “From the third grade up.” After calling her, I discovered that the film was also being shown in grammar schools. Bullying is one of several topics dealt with in the film. Because of its universal appeal, the film can be looked at as the centerpiece of the festival. My guess is that the audience will respond to it, if not with cheers, at least with enthusiasm. It is a beautiful film. The purpose of writing this column about the festival is not only to encourage readers to attend, but also to encourage readers to consider conducting festivals in their own parishes. A countless number of great films are available on DVD. Many parishes have large movie screens. Having a festival might be as worthwhile as having a book discussion club. A religious festival could stimulate serious reflection about the faith. In my own life, films about priests have been a strong influence. What is needed to make a festival successful are people who are enthusiastic and knowledgeable about film, or at least willing to become knowledgeable. In many parishes there are lay people who love film and might be willing to work on a series. I would be willing to help in any way that I could.